Logan (my four year old) made this cute president craft yesterday at preschool to remind mom and dad to go vote! Now that he is four... and a half... I feel that it is appropriate to introduce concepts about our country in simple ways. For instance, he has learned to say the Pledge of Allegiance at school. We have talked briefly about the role of the President of the United States. We have even talked about voting and I have taken him to the polling place with me. In very simple ways, he can now understand the idea of voting for a person who has good qualities. I can be President Too! is a good book about Presidents and would be a great choice this election season. I can be President Too! by Yanitzia Canetti is a wonderful election themed book for preschool through early elementary. The book features fourteen children who all share a paragraph explaning why he or she would make a good president. The children who are featured are very diverse. Each child also represents a character trait like generous, honest, determined, etc. This would be a wonderful book for character education as well. This book would also be a great mentor text to use when explaining simple persuasive paragraphs. 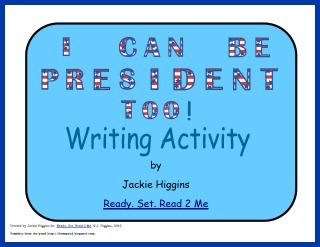 I have created a free election themed writing activity to use with this book. In this activity, students will use a flag themed graphic organizer to plan a paragraph. The student will share why he or she would make a wonderful president. Students will use the prewriting graphic organizer to compose a persuasive paragraph with a topic sentence and four supporting details. You can get this FREE in my Teachers Pay Teachers store! Don't forget to follow my store for more great freebies. I plan on release a big freebie when I hit 100 followers! Perfect for children on election day, something they can understand, relate to, and a craft to make. They need to feel included as so much of the discussion is not child centered. Thank you so much! Pinned, too. Very cute and simple, just right for little ones. This would go along great with the patriotic activities we have been doing.